1. Start at the US 181- SH 188 intersection on the east side of Sinton. 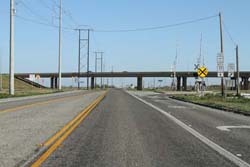 Drive southeast through Taft on US 181 and on to the SH 35/SH 361 EXIT, a distance of 12.8 miles. 2. 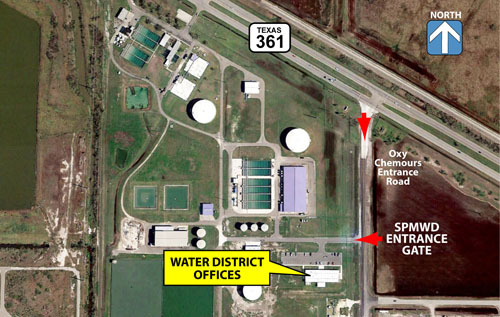 Take the EXIT following the signage direction to Aransas Pass, Ingleside and Port Aransas. 3. Proceed staying on the frontage road. Travel through the intersection with FM 2986. Move to the right and continue toward the freeway underpass. 4. Go through the underpass and into the City of Gregory. 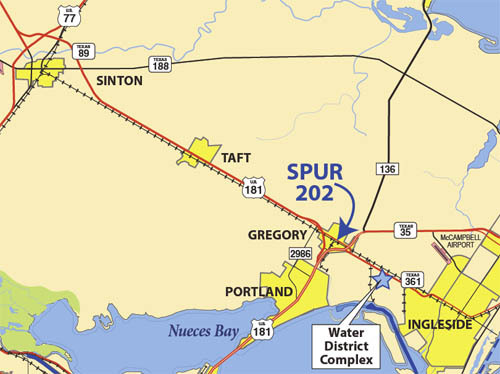 The frontage road becomes State Spur 202 which extends all the way through Gregory to connect to SH 361. 5. Spur 202 parallels the Union Pacific Railroad main line through Gregory. 6. 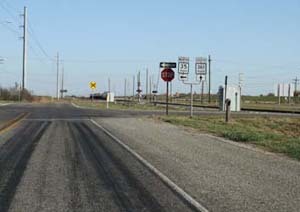 Proceed to the STOP SIGN at the intersection with FM 3284 at the center of Gregory, a distance of 1.5 mile after the US 181 exit. 9. Go straight then angle right to Stop Sign 2 at the intersection with SH 361, traveling 0.9 miles from center of Gregory.